So you’ve posted bail and you are back home after your recent arrest. What comes next? The best thing you can do is find an attorney to prepare for your upcoming trial. Here at Affordable Bail Bonding in Lynchburg, we help make posting bail simple and fast. We provide affordable bail bonds because we believe everyone in our community has the right to return home to await their upcoming trial. 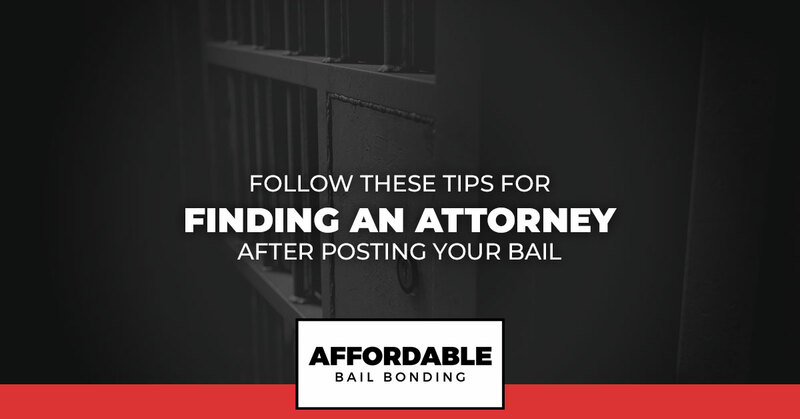 Follow these tips for finding an attorney after posting your bail and contact us if you haven’t yet posted bail to get out of jail. If you were arrested for drinking and driving, then it makes sense to look for an attorney who has experience handling DWI cases. Conversely, if your charge was related to domestic violence, you want an attorney who has handled cases just like yours. Before choosing an attorney, spend some time finding out what cases they have handled in the past. A lawyer who is well-versed in the area of law that your criminal charge falls under will be equipped to fight aggressively for your case. While there are never guarantees with any lawyer, experience can provide a deeper knowledge of how to handle the system. Nothing is worse than feeling like the person you are working with is not listening to you at all. You want an attorney who spends time fully hearing your case. Look for a lawyer who will pay attention to the details you provide and who doesn’t try to talk over you or brush away your concerns. Find a lawyer that instead is empathetic and takes the time needed to hear everything you need to say. An attorney should be putting you first and should never act like you are taking up too much of their time. Choosing someone to handle your case is a big decision. While you do want to get someone working on your defense as soon as possible, don’t rush into something just because you feel panicked. Take the time to shop around and speak with a few lawyers before hiring one. This can allow you to get a feel for what each attorney is offering and will give you a chance to compare costs. As you meet with different law firms, take notes about each place and person you spoke with. During the stress of preparing for court, it can be easy to forget who was who and you might lose important details. By taking down notes, you can sit down on your own and compare each lawyer before proceeding. How long does it take for the law firm to get back to you? It is important to pay attention to the speed of communication from a potential attorney. You do not want to be wringing your hands in worry as you wait for your lawyer to respond as your court date gets closer. Choose to work with someone who makes enough time in their schedule to allow for fast communication. This will ensure that you can reach your attorney as needed without wasting time trying to chase them down. If you are their client, you should be a priority. This should begin from the first moment you reach out. Finally, part of choosing the right attorney is going to be based on your own intuition. At the end of the day, you are the person who is going to be working closely with the lawyer you choose. You need to feel at ease when you speak with them and you need to feel like you trust them. Go with your gut and trust in your own research. There are no guarantees in life and, sadly, there is no way of knowing whether or not a lawyer can get you the defense you want. Do your best to choose the person you feel is the right fit and then work on helping out in any way you can with building your defense. Here at Affordable Bail Bonding in Lynchburg, we are passionate about helping those in our community who need assistance posting bail. While we can’t change what your future holds or how your attorney handles your case, we can help you with the first step, which is getting out of jail. If you need help posting fast and affordable bail, we invite you to reach out to our team right away. We will work hard to secure your freedom so you can move forward with finding your attorney for trial. Call us night or day and get out of jail right away.